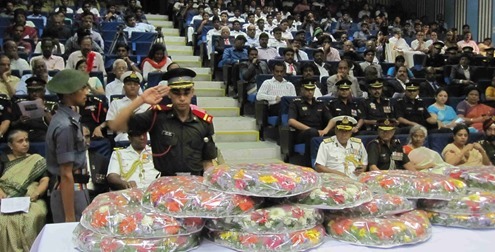 ‘All Faith Memorial Service’ for Martyrs of Uniformed Services of Independent India was held at Indian Institute of Technology (IIT), Madras on 01 July 2014. It was nice to see a large gathering of youngsters to elders assembled in the afternoon to attend this wonderful All Faith Memorial Service. National Maritime Foundation (NMF), Chennai Chapter, joined hands with Rotary International District 3230 to pay homage to martyrs of all categories of all personnel in uniform including the Armed Forces, Para-military Forces, Police etc., who during their life times had braved the inhospitable conditions of the deserts, glaciers, air and seas of the independent India. Indian Army provided Guard of Honour and Buglers for this event. NCC Cadets and Cadets from Officers Training Academy (OTA), Indian Army were all also present. 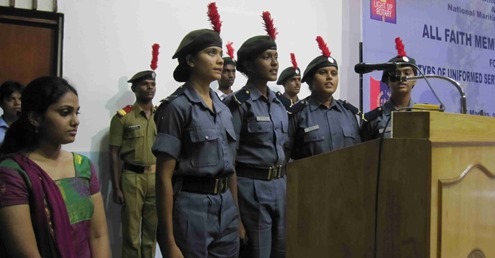 In the previous years 2010, 2011, 2012, this All Faith Memorial Service was conducted at Ethiraj College for Women, Chennai. Conducted by National Maritime Foundation, Chennai Chapter and Rotary International District 3230. Coordinated by Rotary Club of Madras Central Aadithya. All Faith Memorial Service commenced by 1600 hours and completed by 1730 hours. Shri Thiyagarajan: for Hinduism from Bhagavad Gita. Alhaj Moulvi Ilyas Riyazi: for Islam from Koran. Shri P S Surana: for Jainism from Agama. Sardar Harbans Singh Anand: for Sikhism from Guru Granth Sahib. Reverend Kruba: for Christianity from Bible. Retired Officers from the Armed Forces. Consular Corps from USA, UK, Russia, Malaysia. After laying of wreaths, ‘Last Post’ was sounded; two minutes of silence was observed; then ‘Rouse’ was sounded by Army Buglers. Maj General S Murali: Officiating Commandant, Officers Training Academy (OTA). Maj General Jose Manavalan: President, Armed Forces Veteran Officers Association (AFVOA). ADGP Dr C Sylendra Babu: Head, Coastal Security Group (CSG), Tamil Nadu. Mr ISAK Nazar: District Governor, Rotary International, District 3230. Dr M Ponnavaikko: Vice Chancellor, SRM University. NCC Song followed by National Anthem. Guard of Honour to Inspector General S P Sharma PTM, TM, Commander Coast Guard Region (East). Commodore S Shekhar (Retd), Regional Director, NMF, Chennai Chapter addressing the gathering. Verses from the Holy Books of all faiths were read out. 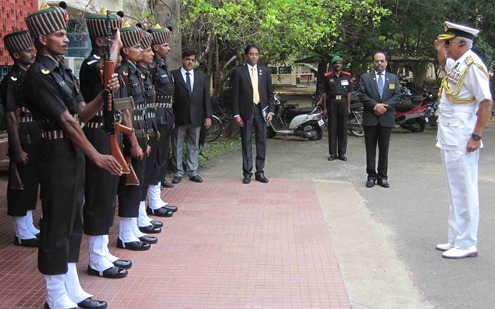 Eulogy by Major General S Murali, Officiating Commandant, Officers Training Academy (OTA). Eulogy by Major General (Retd) Jose Manavalan, President, Armed Forces Veteran Officers Association (AFVOA). 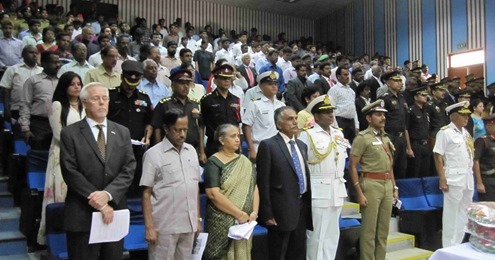 Eulogy by ADGP Dr C Sylendra Babu, Head, Coastal Security Group (CSG), Tamil Nadu. Eulogy by Mr ISAK Nazar, District Governor, Rotary International, District 3230. All Faith Memorial Service concluded with singing of NCC Song and National Anthem. 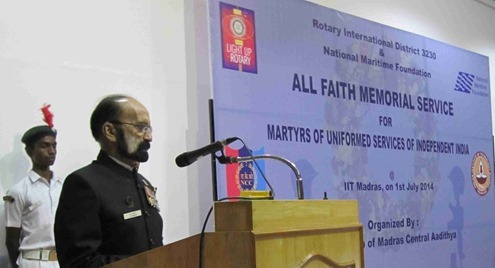 Thanks to NMF, Chennai Chapter and Rotary International District 3230 for organizing this great All Faith Memorial Service for Martyrs of Uniformed Services of Independent India.